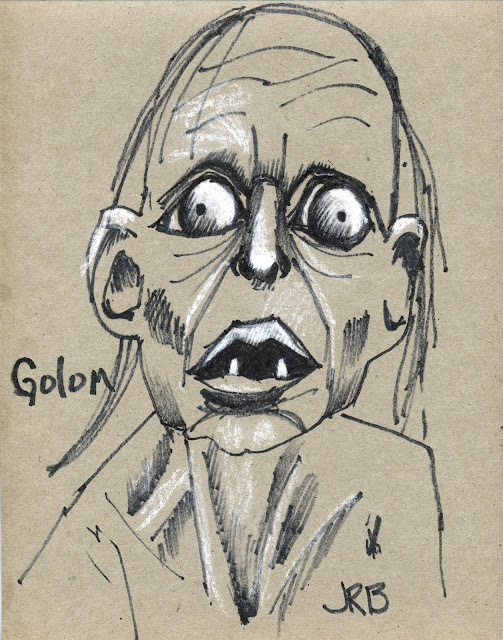 Gollum - Golum - Golom - etc. 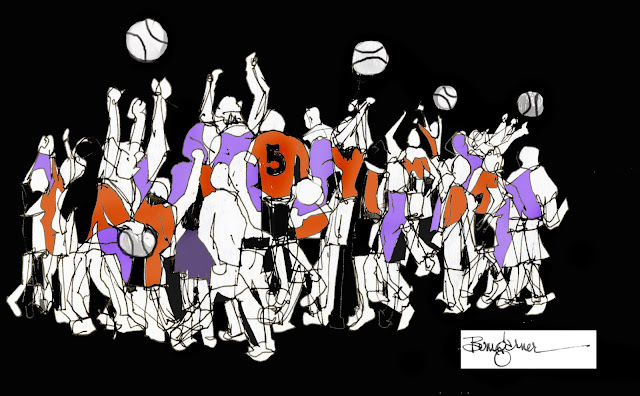 For one of the first times, ever, I just let my pen flow on the page with little concern about accuracy, or photorealistic effect, while trying to capture the high energy and chaos of a youth basketball game. My grandson is in the mix, he's number "5". Once drawn, I scanned the image and added the colors with Photoshop. Some remember when this hospital was nothing more than a group of quonset huts put up in the 1940's to serve the tens of thousands of scientists and blue-collar workers who were working in the Hanford area. 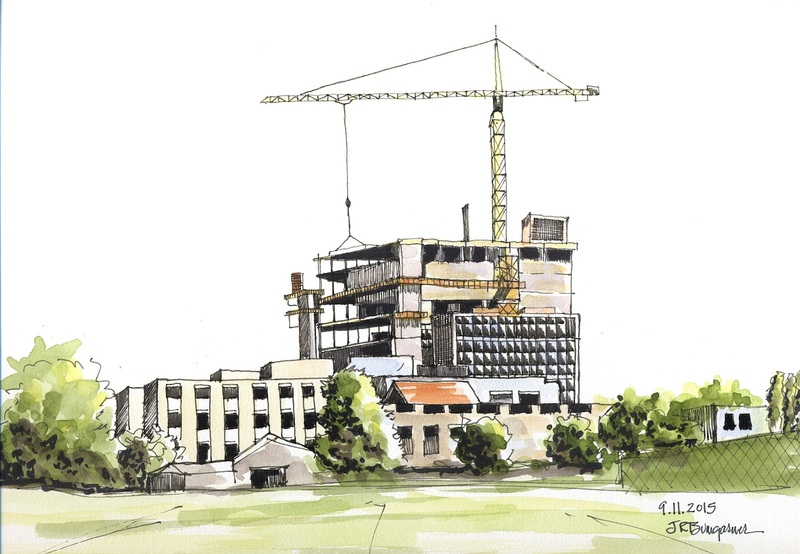 The building in the left section of the sketch came next, then more recently the tall and rather squared section with all the rows and columns of windows was added. Now there is a new section going up: 4 new floors. It looks massive in comparison to what sat there prior to this add-on. A windy, rainy day in Howard Amon park at the Tumbleweed Music Festival. While this group, "Sea Star," played I dodged the rain beneath on old maple tree in the back. Too bad about the weather, I remember last year the park was crawling with people and multiple venues. The venues were up and ready, but the crowd was sparse and easily shaken with only a few sprinkles. "Sea Star" was worth the trip over to do the sketching. Good stuff!! 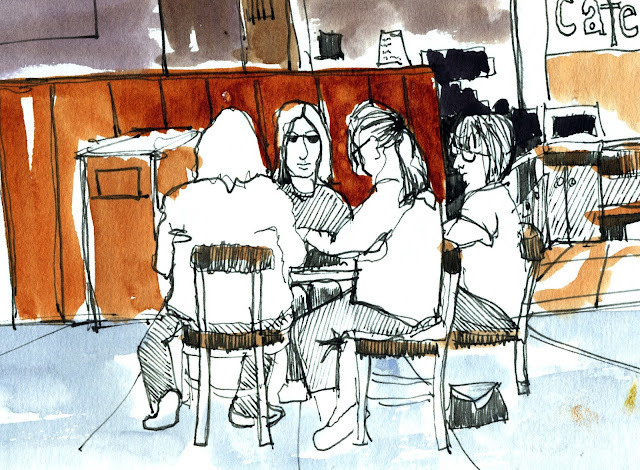 Our little group of urbansketchers here in the TriCities, met up in the local Barnes & Noble here in Kennewick, WA., last Wednesday morning. 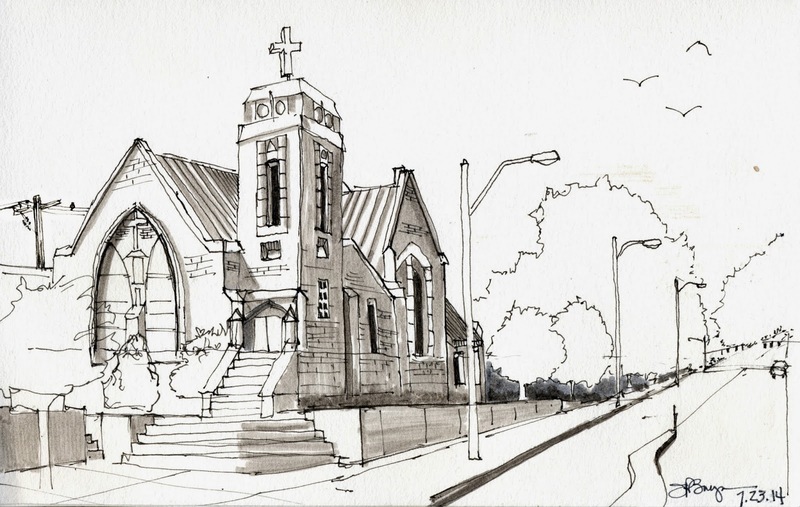 (we go sketching every Weds morning unless it falls on a major holiday, which is seldom.) There were fifteen who showed up and we were actually able to casually, and without planning, take over one entire side of the coffee stand. Most will only give this sketch a quick glance and move on; but there is something about it that I really like. In particular, I like how the dark wood background pushed these artists toward you, the viewer. 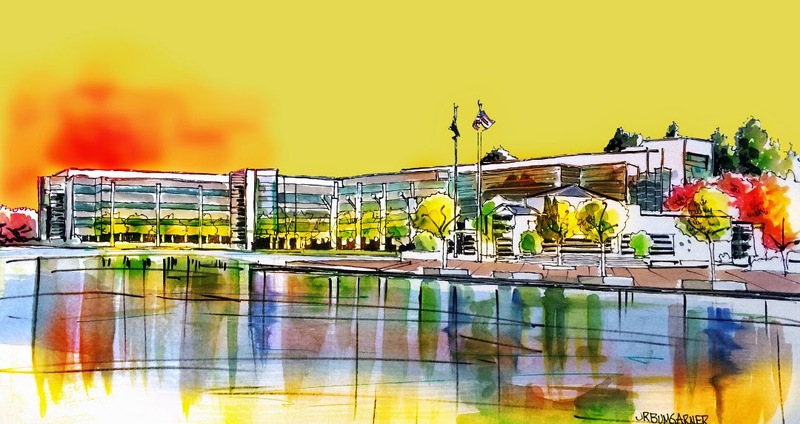 "Nike Campus - Beaverton, OR"
A former student contacted me asking if I would do a sketch of the Nike Campus where she works. Her enthusiasm for my sketching won me over and I said, "sure." 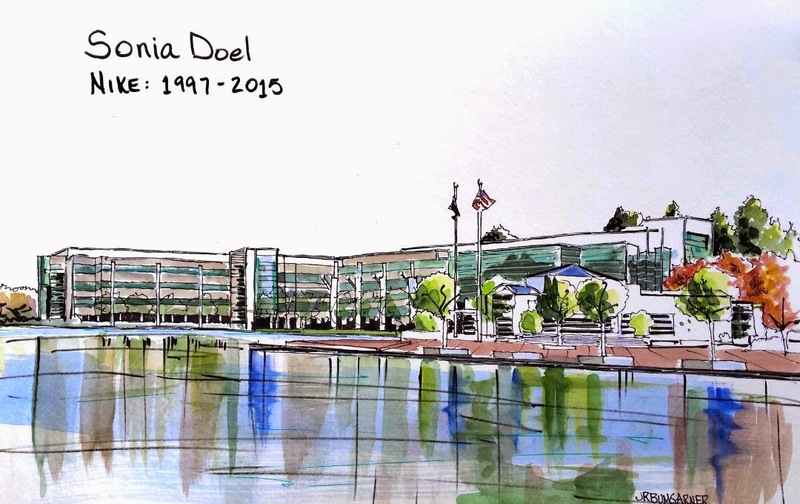 She wants to present the sketch to her supervisor, Sonia Doel, who is retiring in a few days. She wanted me to inscribe the sketch with her name and the dates she was employed by Nike. She also wanted the sketch at 11x17, an odd size, but I learned long ago not to argue with the "customer." After finishing the original, above, I saved it as a file on my computer, then took it into Photoshop Elements and got a little creative with it. I think this one is the better one, but don't tell my former student. ok? "Food Trucks along the John Dam Plaza"
On my way home from sketching the Uptown area, I spotted all these people enjoying the food trucks in John Dam Plaza. So, even though needing to make a "rest" stop soon, I pulled into the parking lot here, grabbed my sketching stuff and went to work. Quick, quick, quick - even adding the color before leaving. 40 mins in, time to go. 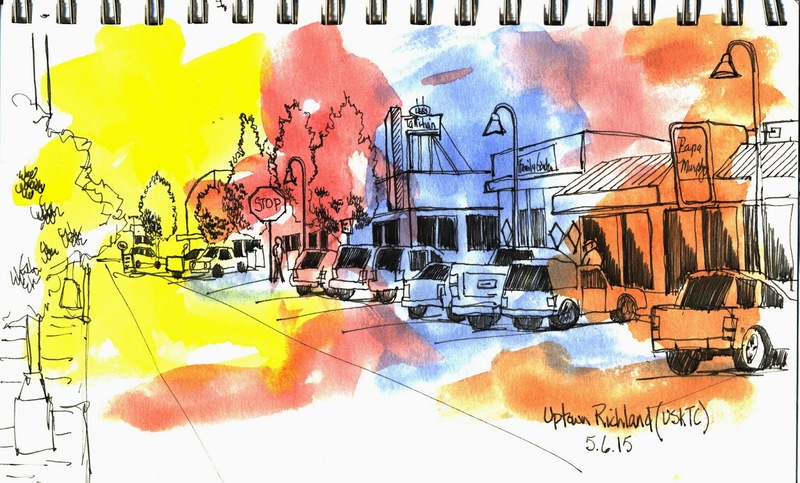 Out sketching with the Urban Sketchers: Tri Cities at the Uptown in Richland, WA., this morning. Some of us started out by having a spudnut, or two, and coffee in the renowned Spudnut Shop just around the corner from this spot. Then with great weather in town, we had a lot of fun sketching together. 6x9 Super Aquabee Sketchbook, Noodler's ink, and watercolors. "Along the Riverwalk in Richland, WA"
With some time to kill this morning (an hour) I drove over to Roaster's Coffee in Richland, then parked in the nearest realtor's office parking lot and sketched these two structures. The sit along the Riverwalk and the one in the foreground houses, among other businesses, Rosy's Diner. It is situated just inside the two windows on the far left. This is one of those occasions when the importance of taking your sketchkit with you at all times becames apparent, as it often does with me. 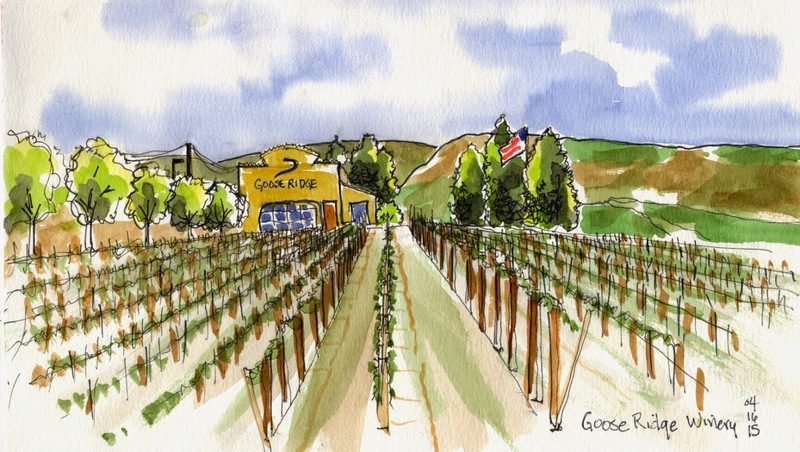 "One of the Many Local Wineries: Goose Ridge"
I stood in the bed of my truck and used the roof top as a work surface to capture this winery from a slightly elevated perspective. It would have worked out better to be a row or two to the right because the winery is too close to center. Another sketch from ground level would have been interesting as you would not have been able to see the grape rows from the top making them a smaller portion of the overall sketch. This perspective is probably a better one. 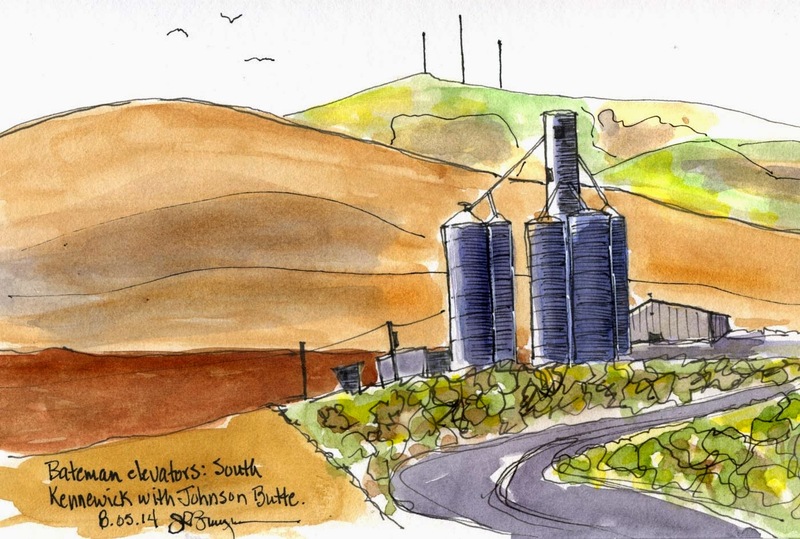 Perhaps a lighter line bordering the winery would have enhanced this sketch some; and always, always insert people. I often get to tangled up in the sketch and forget to do that....I would have had to make them up anyway, as from the particular point of view, no people were to be seen. 6x9 Super Aquabee Sketchbook, Lamy Safari pen with Noodler's Lexington Gray in, and watercolors. My son is a sort of savant with classical music. It started when he first discovered how to slide a CD into a player, about age 4 or 5, I think. You can play just about any piece of classical music for him and he can tell you who the composer is and, more than likely, the name of the piece. He's 33 now, and still appreciates classical notes. 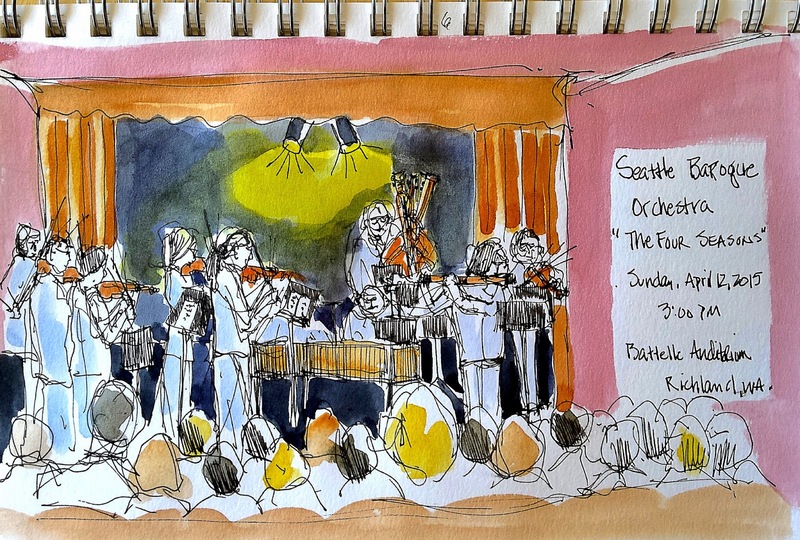 This past Sunday the Seattle Baroque Orchestra was in town at the Battelle Auditorium: Vivaldi's "Four Seasons." So he and I went. 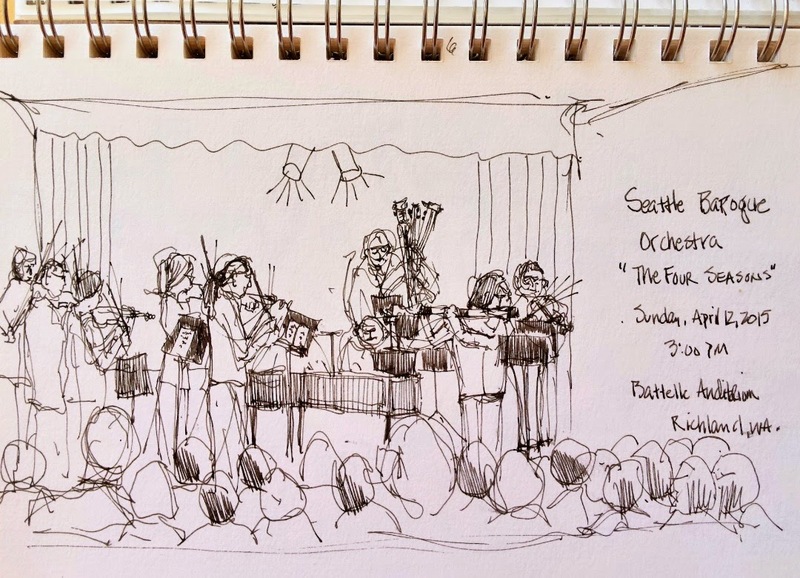 Fully aware of the challenge of sketching people and musical instruments, while they are playing, I took my sketchbook to see about recording the event. Capturing the energy of the music they played is another challenge, so I decided, what the heck, go for it. A few days later, I applied watercolor to see if I could somehow enhance the sketch to push the background back and bring the players and audience members forward. So many times I have ruined pretty good drawings (which I don't think this is....) with color, so it is always a step into darkness to add color to them. 6x9 Super Aquabee Sketchbook, watercolors, Lamy Safari pen with Lexington Gray ink. Each year there is a carnival that come to town, and usually it sets itself up in the Hobby Lobby parking lot on Canal Drive here in Kennewick, WA. Carnivals were always great fun when I was a boy, but the place I didn't like much was the Haunted House. One of the last carnivals I went to as a kid-at-a-carnival, a girl I knew was tossed out of one of the rides. Thankfully she wasn't hurt other than being a little bruised up. So, here it is, the Carnival. "3 Rivers Convention Center and new Hotel"
The "3 Rivers Convention Center," on the left was built some years ago; the structure on the right is the "Springhill Suites: Marriott," which is bran-new. I've been waiting for the construction to be completed because I wanted to draw the two buildings from this particular spot for a long time. Today was the day, and I like how it turned out. 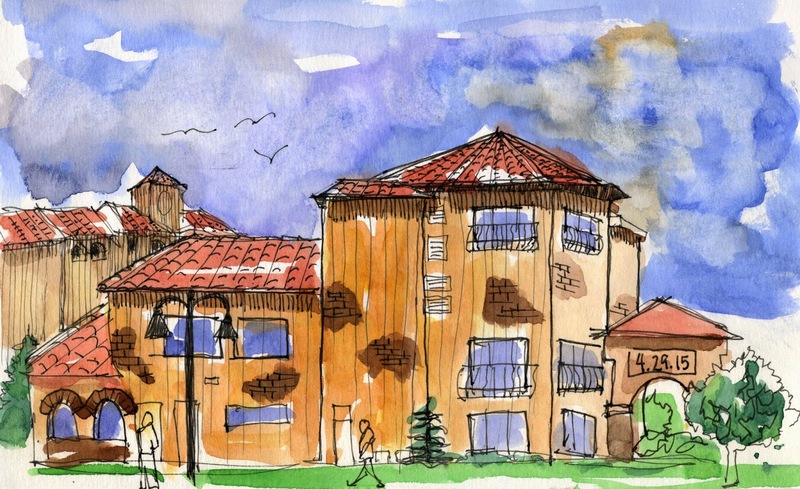 The sketch against the buildings. 5x8 Moleskine watercolor sketchbook folded out to 10 x 5, Lamy Safari pen with Lexington Gray ink, and watercolors. "Clover Island with Pioneer Woman and Lighthouse"
The USkTC group went down to Clover Island, again, this last Wednesday morning to sketch what they could find. I've long been interested in the juxtaposition of this sculpture of Pioneer Woman to the faux lighthouse in the distance, so today, I sketched it out. The lighthouse is for decoration and is not functional, as a lighthouse. Still, it's an interesting feature on the island, one that will maybe someday draw more tourists here. Super Deluxe Aquabee sketchbook, 6x9. Lamy Safari pen using Lexington Gray ink. Watercolors. "East Oregon University - LaGrande, Oregon"
We traveled a couple of hours to LaGrande, OR, today and found some interesting sketch opportunities including the wide view of East Oregon University. This one is a panorama was fun to do as I was seated on the curb's edge of a rather busy street with plenty of rapidly moving vehicles just behind me. It was also a fun sketch to do...note the extension of a small section of the Blue Mountain range in the left-side background. While running a few errands this morning, I drove by this church for the 865th time and decided to find a spot in the parking lot across the street. Hunkered down in my warm vehicle with a clear windshield and a favorite online radio station and my sketchbook. What could be better? After a long year of planning a 50th class reunion, Lois and I decided after it was over we would get out'a town for a while. We discussed a number of options, but it came down to a ten day trip to either Paris, France, or somewhere we had never been: New Orleans. Then, because one place I have always wanted to see is the Gulf Coast between New Orleans and Florida, we decided to take a two-day road trip along the coast to Savannah, Georgia where we would spend the last few days of our trip before coming home. This is the city courthouse in Savannah, Georgia. 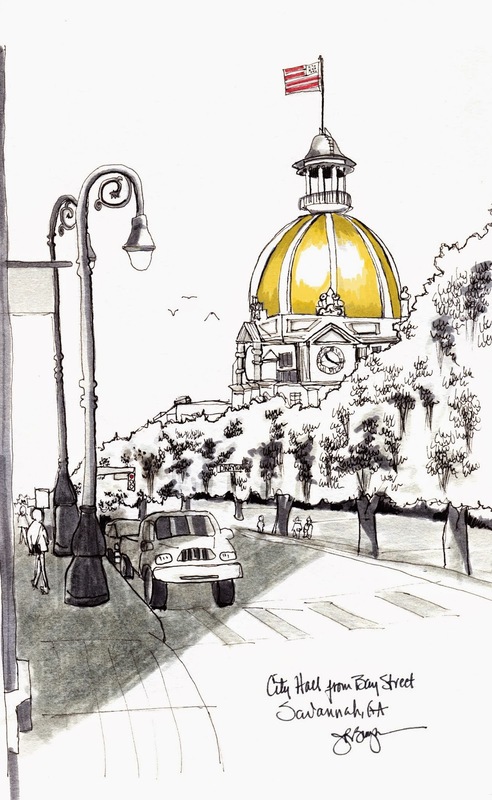 It is my favorite sketch from that trip and you can see the others by simply clicking on this link. This sternwheeling cruise ship comes into the dock at Howard Amon park in Richland, WA., frequently. I happened to be driving to Richland today and noticed it on the river, so I hot-wheeled it down to the benches just off the dock and sketched it coming in. The park was quiet today, hardly anyone there, but fortunately this lady jumped in the frame to get a few pics, so now she's in my sketch. 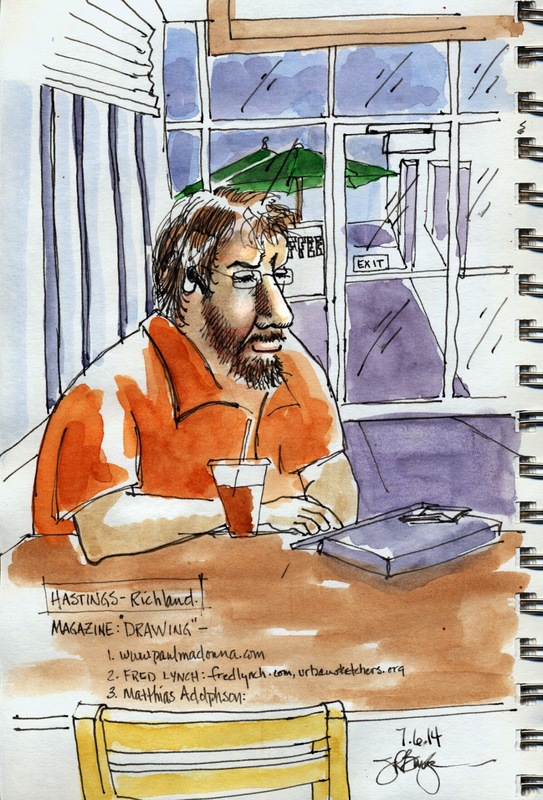 The USkTC group drove to Walla Walla today and met up with Walla Walla sketcher, Jim McNamara, at Starbucks downtown. After a short meet up in the coffee shop, everyone spilled into the downtown area to sketch, then we met back at Starbucks at noon. Normally when we meet up later we have a sharing, but didn't really do that today. I guess sometimes we get too excited about other things going on and today it was when Patty told us she had come across a lady from the Walla Walla Tourist Bureau who wanted to take a few pictures for their webpage. We had the pics taken, then we went to Olives, just across the street (picture below), and had lunch. Afterward we drove over to Jim's house where he and his wife, Diane, showed us their lovely home and Jim's studio. We had a great time. I think this was the most fun we have had on an outing and we have had some really good ones this summer! We are definitely interested in going back to Walla Walla for a longer session next time. 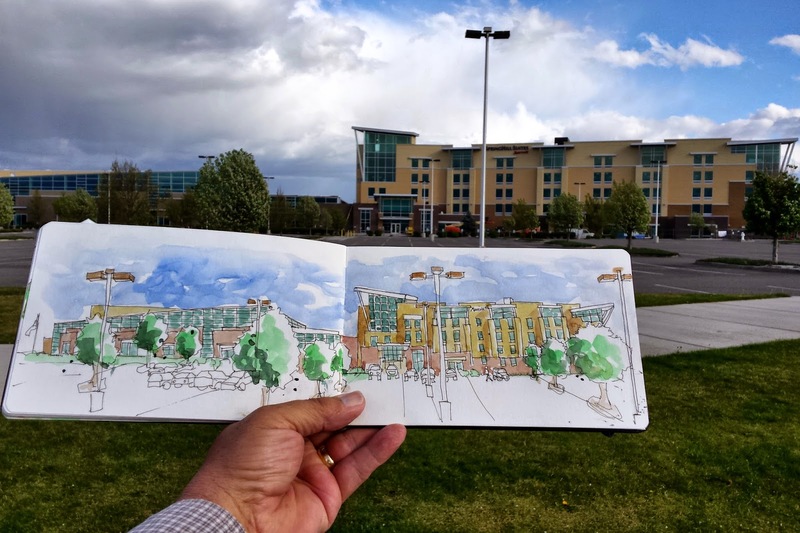 We went sketching at the WSU Richland campus a week ago. 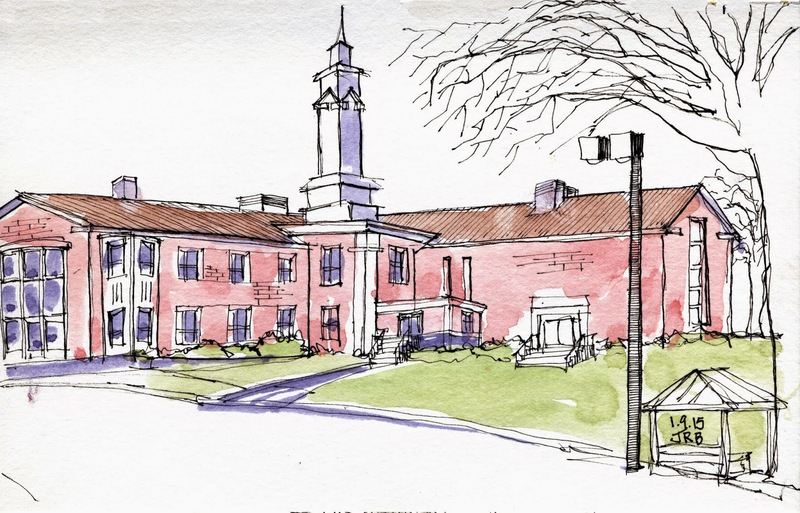 This is the back side of the administration building and not one of my favorite sketches. Still, we were there, so I'll post this to my blog, for posterity's sake . . . whoever posterity is. While in Tacoma, WA., this past week to attend a wedding, I found time to capture this scene of the Tacoma Court House and Museum of History and Industry. We were just leaving the pub where we had lunch and when I stepped out onto the sidewalk and looked left, this is what I saw. I grabbed the basic lines and perspectives in maybe 10 minutes, added a few details and colored it later. "Ice Harbor Dam on the Snake River"
The Ice Harbor Dam sits on the Snake river just a few miles upriver from where the Snake dumps into the Columbia river meandering its way westward toward the Pacific Ocean. Ice Harbor was dedicated in 1963 by then, VP Lyndon Johnson. I remember yelling, "Hi ya, Lyndon," when he passed me by in his motorcade that day. All I got was a stern frown; and probably a wish to know my name so he could change my draft status. 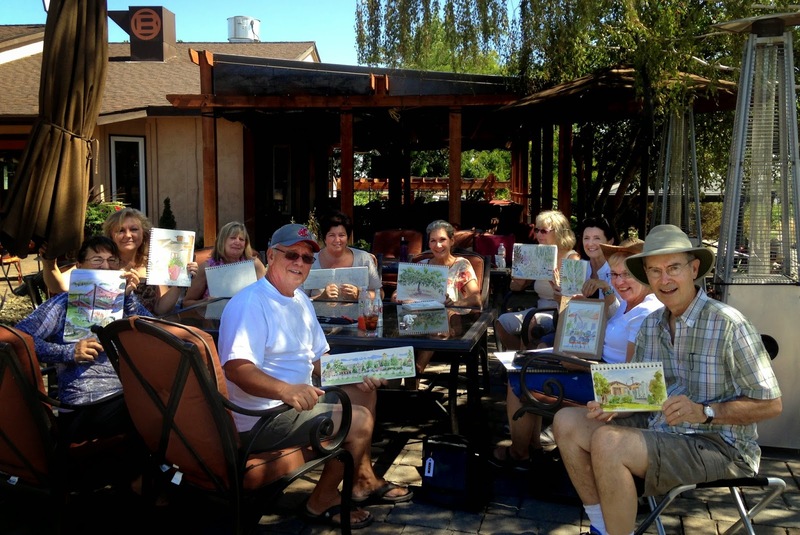 The USkTC (Urban Sketchers: Tri-Cities) group met this morning at Bookwalter Winery on Tulip Lane in Richland. We had a wonderful time, the weather was good, there was lots to sketch, and those who could stuck around and had lunch there. The ambience out on the veranda, beneath the shade of that big birch tree was lovely, and the music was cool, too. 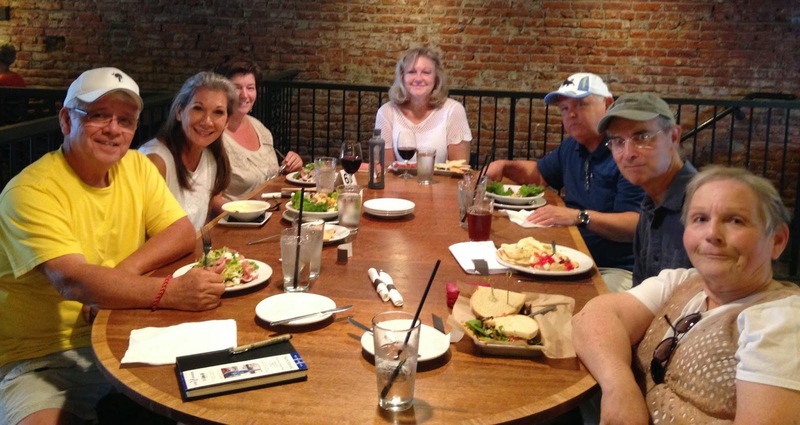 L to R: Patti, Patty, Debbie, Jim B, Cindy, Nancy, Jan, Katherine, Gail, and Jim Mc. 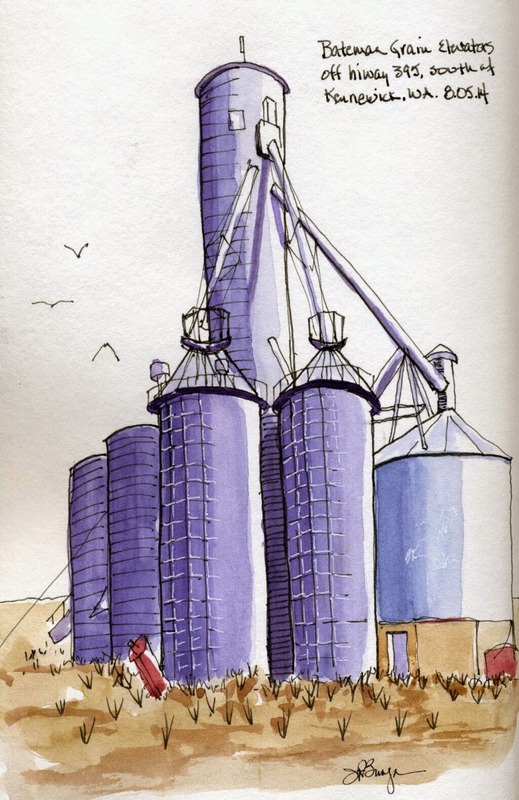 These grain elevators have been pulling on my eye for years, so today I drove by them again and decided to record them in my sketchbook. They belong to the Bateman family who has been growing wheat in the hills just south of town for well over 60 years. No longer in use, they sit here like sentries, making sure everyone who drives by on the adjacent hiway, can see their majesty and know of their past. Lookin south with the wheat fields and Johnson Butte in the background. Bateman elevators from the north side. "The Cabin and the Fir Tree"
If you measure the width of the cabin with your pencil, then use that measure to measure the heighth of the tree, the tree is just over 3 cabin widths high. It's a big tree, and it worries me some. This cabin, along with approximatly 100 others, were constructed in the 1920's to house the dam builders who built the Rimrock Dam on Rimrock Lake in Washington state. They were built to last about 5 years. Today there are 27 still standing and inhabited either year-round, or as vacation getaways for their owners. Once the cabins were constructed, along with a hospital, tennis courts, a grocery store, etc., the little town became incorporated. It no longer is. Today it is simply a cluster of cabins. The cabin in this sketch was purchased by my wife's parents in 1989. It now belongs to her and her sister as both her parents have passed on. We were there this last weekend with our family: our son, daughter and son-in-law, three grandkids and two of their cousins. The cabin was full of people and there is only one shower; but it all worked out. We had good food and good fun together. The kids were so well behaved even the neighbors next door commented. There is a man who lives here year round that paints them, levels them, fixes and improves plumbing and roofing issues. He even traps and kills pack rats. He is scheduled to do the major repairs needed on this one beginning in September. We look forward to many more family outings nestled here in the Cascade mountains. This felt good. It was as though suddenly the lessons I have learned from Frank Ching, Prof Emeritus, School of Architecture, University of Washington, started gelling in my head and hand. This sketch brought over 116 likes from the Urban Sketchers (Global) FB group, and was invited to join the "Explore" group at Flickr.com where, as of today, it has been "favorited" twelve times. It felt good. 6x9 Super Aquabee Sketch Book, ink. Last November I contacted Urban Sketcher, Katura Reynolds, admin for the Urban Sketchers: Portland group, to see if she/they would be interested in organizing the "2nd Annual West Coast Urban Sketchers SketchCrawl - Portland." They agreed that it sounded like fun and was something they wanted to take on as a summer project. 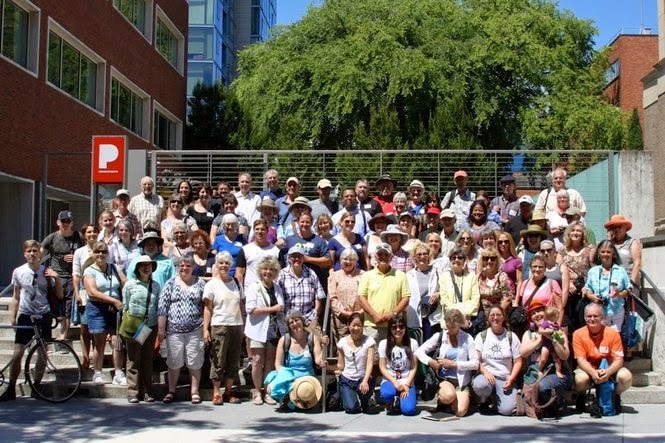 We held it earlier this month on the 11th and 12th in Portland with just over one hundred sketchers from as far away as Montreal, Quebec, and Burma. The Portland Art Museum hosted our noon sharing when this group photo was taken by the Oregonian. 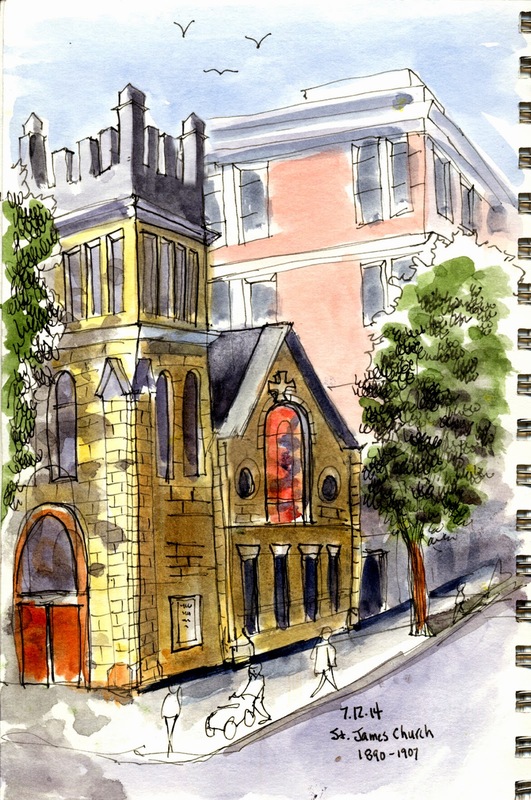 My rendition of the St. James Lutheran Church which sits along the South Park Blocks in Portland. The Blue Bridge crosses the Columbia river between Pasco and Kennewick, WA. 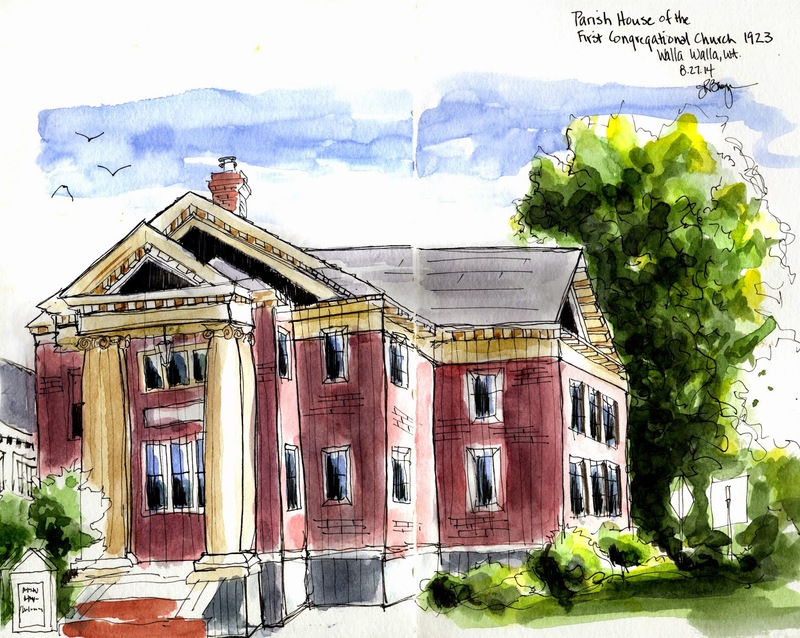 My USkTC group was there last Wednesday morning for our weekly sketchabout. It was hot. My son, Derik, and I went to Hastings in Richland today. They sell books, old and new; CD's, DVD's, posters, magazines, and coffee. While he perused the books and vids, I purchased an iced latte, checked out a couple of art mags, and sketched this guy sitting at the next table. One sometimes feels abit like, maybe, James Bond sketching people this closely and not getting caught.